We're all afraid of something, right? Me, I'm ascared of Jell-O. Any kind of jiggling and gelatinous aspic-like substance makes me want to run right underneath the covers in my jammies. And I don't even own any jammies. My friend Richard, an eminent professor of psychology (and equestrian water sports enthusiast; don't ask), has long been disturbed by this fear of mine. But then he's afraid of being buried alive in a 50/50 wet blend of Rice Krispies and Count Choculas, and so who, I might ask, is the real head case here? By the looks of the couple standing next to me in the fish market when I picked out this particular sea creature, octopus is to many what aspic is to me. I feel sorry for these people, don't you? You don't? Then you haven't tried my insalata di polpo (octopus salad). Sometimes I grill it, but this time it was into the pot (filled with well-salted water and a bay leaf) for about an hour. Let it cool before slicing the hell out of the poor (shrunken) thing. Tossed with a good Sicilian olive oil, garlic, parsley and a little balsamic. Almost as easy to make as Jell-O. And not nearly as scary. I can't speak for the other members of my family, but Christmas Eve is my favorite night of the year. It is the one meal, the one gathering, the one event that I look forward to. Every day of my life. And it is an event. We sit down to dinner together at around four o'clock in the afternoon usually; it's rare that anybody gets up from the table before nine. We are a tightly knit group, this family of ours. There is Aunt Anna and Aunt Rita, Cousins Josephine and Frank and Alec and Joanna and Joanie. Brother Joe is on hand, of course, and the missus and me. You have heard of the Feast of the Seven Fishes? It is a Christmas Eve tradition, thought to have its roots (like my family) in Southern Italy. 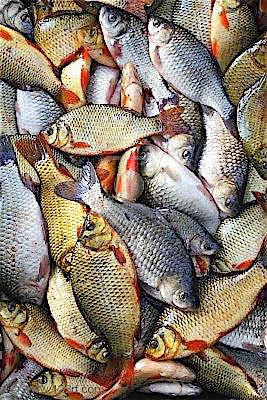 The meatless meal consists of seven different seafood types, though I have never met anybody who is strict on this point. We certainly aren't. I did a loose count of last year's Feast and came up with 10 different species on the table. I had been planning to post this greeting straight from the Christmas Eve dinner table, but an illness is looking like it will cause me to miss the trip back home this year. I have been trying to remember the last Christmas Eve that I did not spend with the family. I can't. That's good, I guess. But it makes not being there this year all the harder. And not just because of all the great chow I'm missing out on. Speaking of great chow, here are some scenes from last year's Christmas Eve festa. It's the best I could manage under the circumstances. Or, how a very brief detour away from his chosen profession left The Meatball lost, broken and desperate to get back home and to the kitchen where he belongs. It isn't every day you get asked to make a life-and-death decision. And yet, on a clear day in late October, following a lovely lunch of orzo topped with grilled eggplant and pine nuts and fresh Sicilian olive oil and feta, there it was. To my astonishment, I received a callback, and days later was sitting around a drab brown folding table with three representatives of an FBO (that's fixed-base operator to you civilians) that provides deicing services for the airport. All of the men were younger than me, two of them very much so. Things could not have been more hospitable during our "interview." Nobody had the slightest expectation that I would arrive bearing deicing knowledge of any conceivable sort, which meant that I was principally being scrutinized for my character. And that, if I may boast, is a thing that I am known to possess. The conversation's defining moment came after the senior member of the trio, the man who had kindly contacted me about the job in the first place, finished describing the deicing procedure, specifically the part involving the crew member (me in the example put forth) who sprays the hot deicing fluids onto the airplanes. "After you've determined that the aircraft is clean and safe for takeoff we inform the pilot that the plane is good to go," he said matter-of-factly. "Are you comfortable with that?" This is the moment when I began to laugh. And ponder whether I was the only knucklehead in the room who had caught the extraordinary irony in the man's ominous words. "I decide the plane is safe to fly," I said as incredulously as I could manage without appearing unconfident. "You're kidding, right?" The three colleagues glanced at each other and then at me. "I'm not kidding," the man responded, a bit tenuously I thought. "You're the guy who's up there spraying. Nobody else can see what you do, so it's gotta be your call." He paused for a moment before adding, "Is that okay with you?" The taste of eggplant and pine nuts and feta still lingered a bit on my tongue, which comforted me at a much-needed time. After all, none of the words the man had just now uttered could be characterized as comforting in the slightest possible way. A plane filled with perfectly innocent people might be cleared for takeoff — in a snowstorm perhaps — because I say so? Still, I am nothing if not willing to investigate a new challenge. "It's okay with me," I said, a bit less snidely this time. "I can't imagine why it'd be okay with anybody else. But, hey, I'm willing to give it a shot if you are." Weeks later, just before heading to New York for Thanksgiving dinner at cousin Josephine's, I was working my first scheduled deicing shift, on a Monday from 5-9 a.m. I had completed two full days of classroom training by then, aced many written exams, cleared a slew of security hurdles required in order to be employed at a United States airport facility, and spent an entire afternoon with three career aviation pros whose job it is to familiarize newbies with the company's equipment and procedures. This outfit's principal piece of deicing apparatus is a $350,000 behemoth. It is part monster truck, part Klingon warbird. It takes two people to run the big yellow monster, one to move the truck around the aircraft, another to spray glycol, heated to as much as 180 F, onto the planes. I had not yet been cleared to operate the truck at that point, and so it was not a shock to learn that my initial four-hour shift would be spent "in the bucket." I am as surprised as you that I was allowed to step inside such a contraption. Let alone move it about multimillion-dollar commercial aircraft spraying hot chemicals designed to protect both the planes and the humans who travel aboard them. As my mother might have said, Madonna Mia! The morning of my first shift was not what you would call a weather-event kind of day. The temperature was around 30 as I recall. There was no rain or snow or ice on the ground, nor was any in the forecast. All I could see when I arrived at the airport, at around 4:45 a.m., was the faintest hint of frost on one or two cars in the employee parking lot. No matter. As soon as the 5-member deicing team had gathered (two crewmembers for each of the two trucks on duty, plus a supervisor) it was off to the "deicing pad," where we waited for the first scheduled departure, at 6 a.m., should the plane require our services. 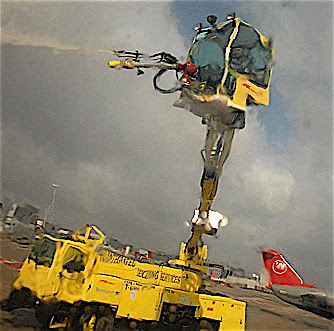 Deicing, it turns out, is not necessarily what you might imagine it to be. For instance, it isn't always about getting ice off of a plane, or snow, or hail, or even freezing rain. The general rule in aviation (that sure sounded like I know what I'm talking about) is that you don't fly with "contaminants" of any kind on the plane's surface, especially on the wings and the tail. Frost is considered a contaminant, and therefore, technically, should be removed before takeoff, just as the far more dangerous ice must be. But where light frost is concerned, a good amount of pilot discretion comes into play. Take the morning of my virgin leap into this stunningly important profession. 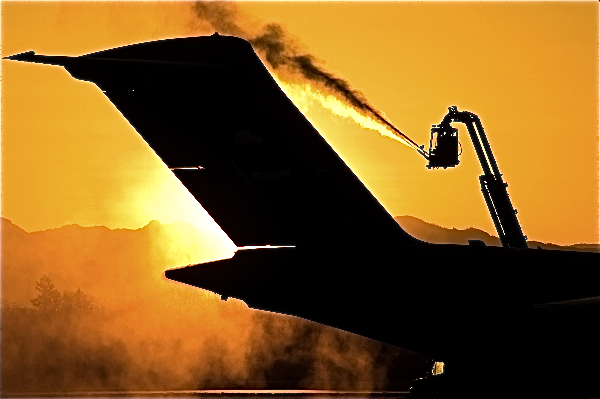 Though the 6 a.m. flight taxied off with nary a thought of deicing, the next flight, from the same carrier, did in fact come over to the pad for a spray. There was likely no difference whatsoever between the two planes, not where the amount of evident frost is concerned. Both had arrived at their respective gates the night before, and both had been parked outside the terminal overnight and under the exact same weather conditions. And they backed out of their gates, which were right next to each other by the way, no more than five minutes apart. What happened? One pilot played it ultra safe and had his plane deiced, the other one didn't. Simple as that. It is the pilot's call, I have been repeatedly told, and no one else's. Remember that next time you're sizing up El Capitan out of the corner of your eye while passing the open cockpit door as you're boarding your flight. Which brings us back to the original life-and-death decision I was so all hopped up about in the first place. Turns out that it's the pilot who decides that his plane is ready for takeoff, not the deicer, as it is the captain who has supreme responsibility for the safety of his aircraft, its passengers and crew. That ought make you feel better. And it should. After all, the rules of aviation safety are written by professionals who are far more expert than I. Except that I keep thinking about what we learned in our training classes. The pilot can only see a portion of the wing on his side of the aircraft, and so if that portion of the wing looks clean then he's figuring the rest of the plane must be clean too, and that the deicer has done his job. I won't soon forget my first deicing. Because it scared the bejeezus out of me. Sure, the frost was so slight that it took no time at all to deice the big Airbus jet. But you try moving around a giant mass of steel and jet fuel and screaming engines and glass and people while you're strapped inside a mechanical robot that's three stories high and looks like it was designed by Gene Roddenberry on a night when he was very, very high! Let's see how calm you'd be. In case you were wondering, no, I did not turn out to be a very good deicer. The bucket controls, two giant joysticks which confounded me from the start, clearly were my undoing. (A trainer had warned me this might happen, as I had never before used a joystick in my life.) Thing is, the joysticks are all that matter in the bucket. They control every up, down and sideways motion the bucket makes, and dozens of variations in how fluids are sprayed — all of which changes constantly (and maddeningly) while you're moving about the aircraft trying to do your job (oh, and not crash into anything). Master the joysticks and you are golden. Don't master them and you are screwed, plain and simple. After just 45 hours and 30 minutes on the job, it was clear to me (and, I think, everybody else on the crew) that the joysticks had got the better of me. That is when I reluctantly decided to resign my position in the aviation field and do my small part toward making the skies once again safe. I had just come down from the bucket after spraying around 20 gallons of what they call Type I fluid (that's the kind used to clean ice and snow and frost) onto a plane that needed only five. At about $13.50 a gallon, that means, well, do the math. And it could have been a lot worse. A couple days earlier, when there was real ice on the planes, the sprayer in the truck I was driving went through 130 gallons of glycol — just on one side of the plane! My supervisor, the nice man who had hired me, could not have been more supportive. "Maybe we'll put you in the truck the next couple days," he said once we were alone in his office. "You're a good driver, we could still use you." I thanked him for his kindness but then reminded him that, the way his deicing crews are built, it's highly preferable that crew members be proficient both in driving the truck and spraying planes from the bucket. "You're a good man to put yourself out," I said, gathering my things. "But we both know that's not how it works." I thanked the man for giving me a shot at the job, told him to forget about paying me for the hours I'd worked, and apologized for letting him down by allowing myself to be done in by the Joysticks From Hell. I went home feeling pretty puny and decided that an hour on the treadmill might help blow away some of the bad juju that had hovered over me all morning. Then I went upstairs to the kitchen and made a batch of potatoes and eggs, a food that has comforted me more times than any other and throughout all of my life. Just as I had finished my lunch a plane passed over the house. I was standing in the kitchen at the time, feeling a bit nostalgic for the part-time career I had just left behind. But mostly I was happy to be back in a place that I belonged. So I'm in the middle of making a batch of fresh ricotta (that would be the same fresh ricotta that was scheduled to wind up being my famous cheese gnocchi) when the call comes in that scraps the entire evening's plans. To make the ricotta, start out with a gallon of whole milk in a non-reactive pot, then gently stir in six tablespoons of distilled white vinegar. Turn the heat on very low; this means it will take a long time for the milk to heat, but it's better that way. Stir occasionally and gently until the temperature reaches around 190 degrees F.
Turn off the heat and start scooping. A cheesecloth-lined colander does the trick. At this point you're all set if all you want is fresh ricotta; the only thing left to do would be to salt it to taste and let it drain a little while. To make the ricotta salata, though, the cheese must be drained further. I tied the cheesecloth with string and hung it from the kitchen faucet. After about an hour the cheese had sufficiently dried. At this point you add about a tablespoon of kosher salt and mix with a spoon. Then it's time to pack the cheese into a mold with drainage. I used these tins that I saved from fresh store-bought ricotta. Weight it down for another hour, occasionally applying pressure to get out as much moisture as possible. After popping the cheese out of the mold, all that's left to do is apply more salt. Very lightly sprinkle kosher salt all over the cheese once a day for about a week, keeping it covered in the fridge the whole time. More moisture will seep out of the cheese during this time, so keep draining it off. After you're done salting, keep the cheese covered in the fridge for another week or two and that ought to do it. Just one other thing. If the cheese winds up too salty (as this one did) I place it in a bowl filled with water and allow the salt to leech out for as long as it takes to suit my taste. This batch soaked for about 24 hours, and I changed the water three times. Then my friend Gloede showed up and sprinkled some of the ricotta salata on a caramelized onion and prosciutto pizza he was making in my wood-fired oven. And I forgot all about the guests who did not come for my gnocchi dinner.